Living in the greater urban landscape of Washington, DC, gives us so many options for weekend activities and so many organizations and people to connect with. Monuments, world-class museums, historic sites, restaurants, clubs, and performing arts venues are all at our fingertips. We can, however, get drawn so far into the urban lifestyle that we forget about the wildness of the natural world. And even when we feel the itch to go out into nature, it can be hard to find places off the beaten path that make us feel truly connected to it. When the idea of writing a series of blog posts for urban naturalists was proposed to me, I thought about one of my favorite books, Farm City: The Education of an Urban Farmer by Novella Carpenter. In the memoir, Carpenter documents her experience of taking over a small abandoned plot of land next to her house in a section of inner-city Oakland. Raising chickens, ducks, bees, growing fresh vegetables and flowers, she transforms the block where she lives, making it a play area for children, a place for low-income families to find healthy, fresh vegetables, and adding beauty to an otherwise forgotten section of the neighborhood. Carpenter’s account of an urban transformation reminds her readers that wildlife, plants, flowers, and natural beauty are not far away from us urban dwellers. In fact, these things could be right next door. You might already know about Rock Creek Park, the US National Arboretum, and C&O Canal towpath. Here are a few other places and ways you can experience the beauty and wonder of the natural world in the DC-metro area. According to an article written by Tanza Loudenback for Business Insider, Alexandria, VA, ranks 22nd on a list of America’s top cities to live if you love the outdoors. With 20 nearby state parks , you can find many different points of access to the Potomac River* and to other natural areas. Alexandria is a beautiful area situated on the banks of the Potomac, but it is not the only place you can access the river in the DC area. Depending on just how adventurous you would like to be, you can either use Google Maps to locate your nearest river access point, finding the green spaces that mark park areas, or go to River Explorer to find areas of access. Not sure what to do when you get there? See some ideas below. A truly wonderful place to go and explore are the aquatic gardens at Kenilworth Park . 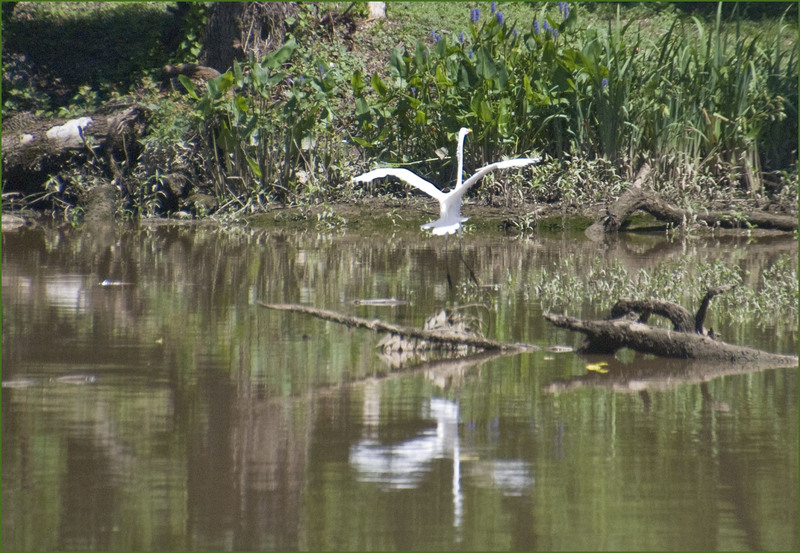 Situated along the banks of the Anacostia River, the aquatic gardens give you an up-close look at this historic river. This special section of National Park Service land offers many opportunities to observe birds like hawks, great bald eagles, blue herons, and osprey. A large diversity of song birds can be found in the marsh areas as well. Bring a pair of binoculars and a little lunch and find a spot to enjoy the sights that make you feel like you have left the city behind and stepped into the wild. There are regular, guided nature walks and a Junior Ranger program for the kids. The gardens are open year round. Who would have known that one of the country’s biggest fish migrations goes right through the heart of our nation’s capital? Each year, the shad migrate from the ocean and into the Potomac River to spawn. The migration can be seen if timed correctly. The National Capital Chapter of Trout Unlimited publishes a nice report that will help you stay up to date about the status of the migration. Watch a couple videos about the shad migration and plan to go out to spot these aquatic travelers. A nice place to go for a hike and observe some shad water is Fletcher’s Cove . The Boathouse at Fletcher’s Cove offers a large variety of activities that can engage children of all ages, including canoeing, kayaking, paddle boarding, row boating, and biking. Want to hike but don’t want to leave the city? The Mount Vernon Trail is a site to see. With beautiful views of both the DC skyline and the Potomac River, hikers can experience a true urban wildlife on this 18-mile trail. Add in a little history about George Washington at the start of the trail at Mount Vernon or go straight to the finish line and explore Theodore Roosevelt Island. The D.C. Department of Energy and Environment Aquatic Resources Education Center is a great place to explore and learn about the natural world in the DC area. Parents can register online for “Family Discovery Days” and free family fishing days. Or, just go for a visit and see what is being offered in the way of programs and tours of DC’s urban natural setting. *Although the Potomac is a beautiful place to explore, it is also one of the nation’s wildest rivers. In fact, it has been called the nation’s wildest urban river. So, proceed with caution when participating in recreational activities. Always follow water safety regulations and be mindful of the unpredictability of the river’s flow rate and bottom structure. One of the best ways to engage in the natural world is to help create more of it. When winter holds us in its grasp, it is a great time to start thinking of planing or returning to the garden. The website, GrowVeg is a great resource that will give you specific plans for your garden and your growing region so you know what to plant and when. Taking the kids out into the garden can generate all kinds of new ideas. Many adults who feel connected to nature were sparked at a young age with explorations of a garden. Keep it simple: get a pack of seeds from the supermarket, start them inside under a lamp, and when the frost ends (generally the last week of April), take them out to a little garden area. Live in an apartment? Take a look at this great resource for Apartment Gardening . 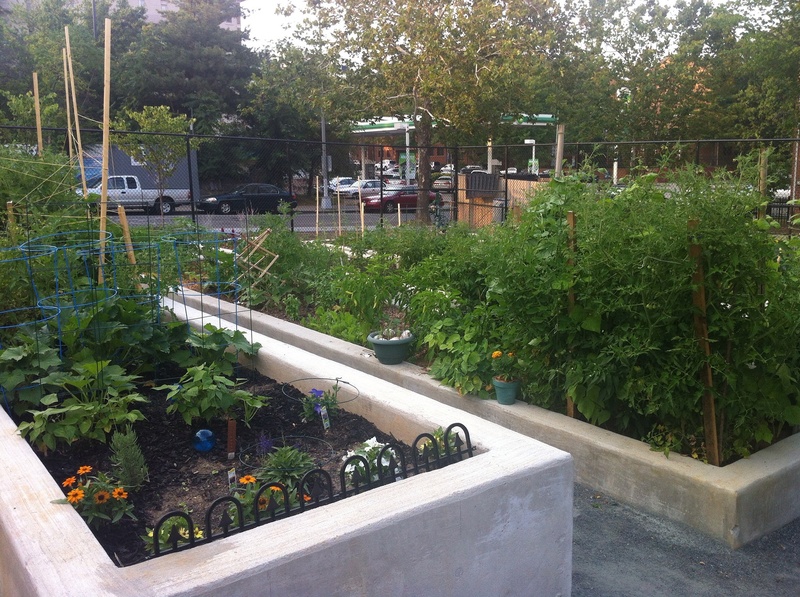 The DC Department of Parks and Recreation also runs community gardens . You can get on a list for a plot on their website. Washington Gardner also has a list of community gardens in nearby Virginia and Maryland. Composting doesn’t have to be a big operation. Small composting containers can be found for composting in the kitchen. People tend to think that if you compost, you have to use it in a garden. Even if you throw away your compost into the garbage, you’ve already started the process, and it will be less likely to take up space in a landfill because of your helping hand. For those interested in having the compost taken away, Fat Worm Composting offers a pick-up service and will even return a bag of soil to you. Backyard composters can be purchased, and they do a great job of keeping critters out. To learn more about backyard composting, take a look at this article, “The Dos and Don’ts of Backyard Composting written for Treehugger.com. In Richard Louv’s book, Vitamin N: The Essential Guide to a Nature-Rich Life , he promotes Sharon Lovejoy’s idea to plant a pizza garden. Louv writes, “Grow a pizza garden with your choice of ingredients—tomatoes, zucchini, peppers, spinach, onions, basil, oregano, and more—in the shape of a pizza.” Many times, it can be hard to think of all the things you can successfully grow, how to use them, and where to find the space. But, making a themed garden can be a fun and motivating way of gardening. For more ideas on gardening with kids and themed gardens, check out Lovejoy’s book Roots, Shoots, Buckets & Boots . Don’t have the space? Volunteer! DC Greens is a great organization working to supply DC residents with fresh produce. They have even started a farm in the middle of the city! Every Thursday evening from March to October, the farm allows volunteers to come and spend some time working the fields. Visit their website to learn more about the K Street Farm and how you can spend time working on this urban plot. Thanks to dedicated environmental groups in the greater DC area, many of our creeks and rivers are getting cleaned up at one of the fastest rates in the country. 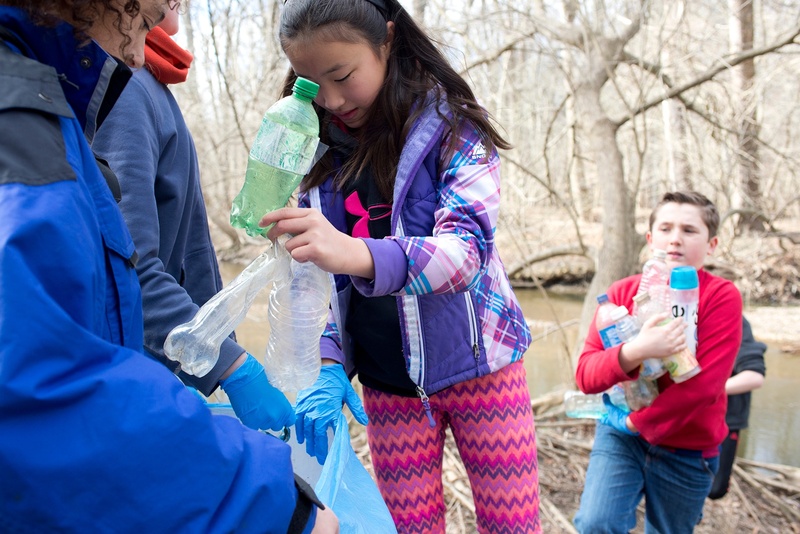 Groups like the Rock Creek Conservancy , the Anacostia Watershed Society , and the DC Chapter of the Surfrider Foundation host cleanups of Rock Creek and nearby waterways. Participating in one of these cleanups always seems to lead to more outdoor opportunities. Working with these organizations is a great way to connect with other outdoor-minded members of the community. You may have seen the influx of brightly colored bicycles lining the sidewalks of the DC metro area. These bikes are a revolution in the world of public transportation. Whereas Capital Bikeshare requires a membership, and riders must pick up and drop off bikes at certain designated locations, companies like LimeBike and Ofo Bikes offer bikes that can be picked up and dropped off anywhere within a large range. The only requirement is a charged smartphone that can download an app for each bike company in order to unlock and ride. Use the DC bike maps to navigate and decide where you want to go. If you have children old enough for one of these simple and easy-to-ride bikes, you can ride to any area where the wilderness awaits. 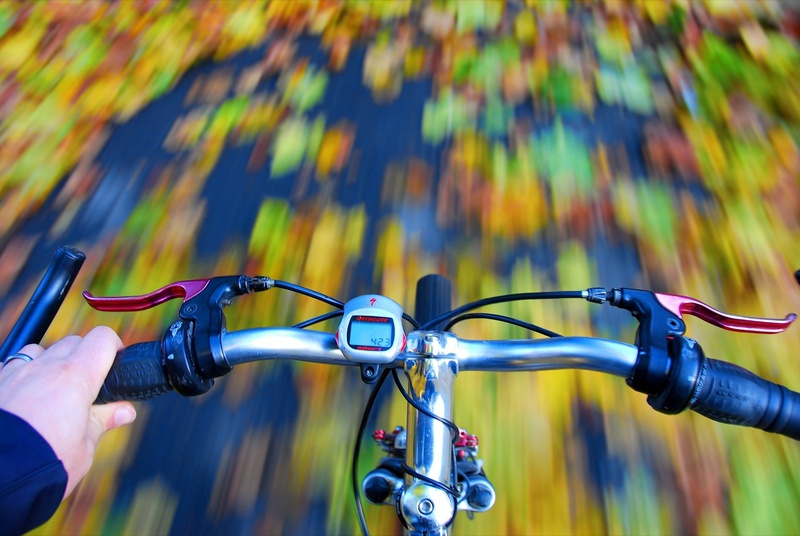 Drop your bike, walk into the natural world and back out again without expelling any greenhouse gases, feeling great about your environmental impact for the day. Maybe it will leave you feeling a little better about eating that burger at the end of a long day of calorie burning with the kids. Scott’s Run on the Virginia side of the Potomac offers a nice, easy hike, terrific for kids. You’ll find a good size waterfall and plenty of natural beauty to explore. 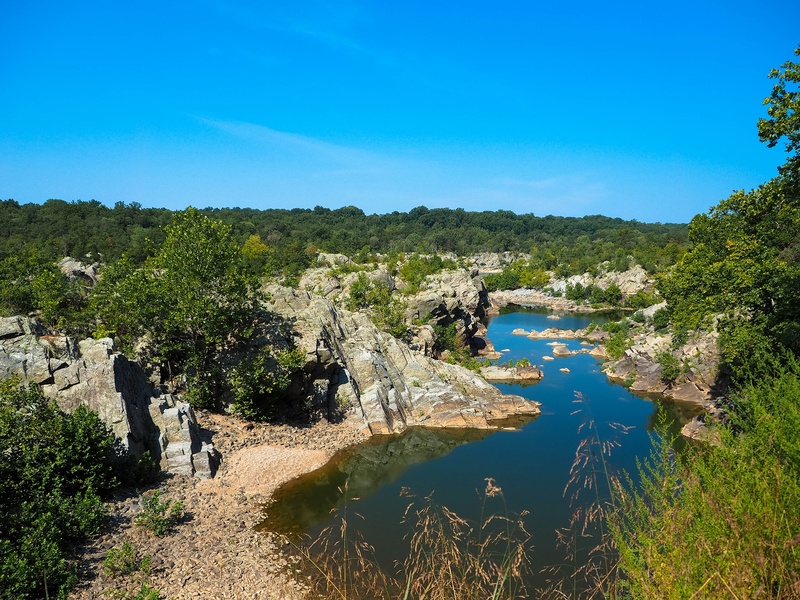 The Billy Goat Trail on the Maryland side of Great Falls Park is a classic. Branching off of the C&O Canal, the Billy Goat Trail offers stunning views of the Potomac that make you forget you’re anywhere near a city. Be prepared for exciting rock scrambles and lots of little pools with tadpoles and frogs. Go early to avoid the crowds as this is one of Maryland’s most popular hikes. If you are hiking with children and they get tired, there is an alternate exit that shortens the loop. No dogs are allowed on Section A. Check out the National Arboretum's Moon Hike . This is a great way to explore at night with some experts in the field. A true and not-well-known gem of the DC area is Kingman Island This wonderful Potomac River Island is great for hikes, birds, fishing, and much more. Visiting the island is a plus for history buffs or those who are simply looking to learn more about the local area. Run by the well-known Living Classrooms Program —there are many environmental education and learning opportunities available if planned in advance. But it’s not always all about science: you can also look forward to the Bluegrass and Folk Festival held each year on the island. It’s a truly unique and artistic outdoor experience.